Taylor and King of Manchester, 1923-25. 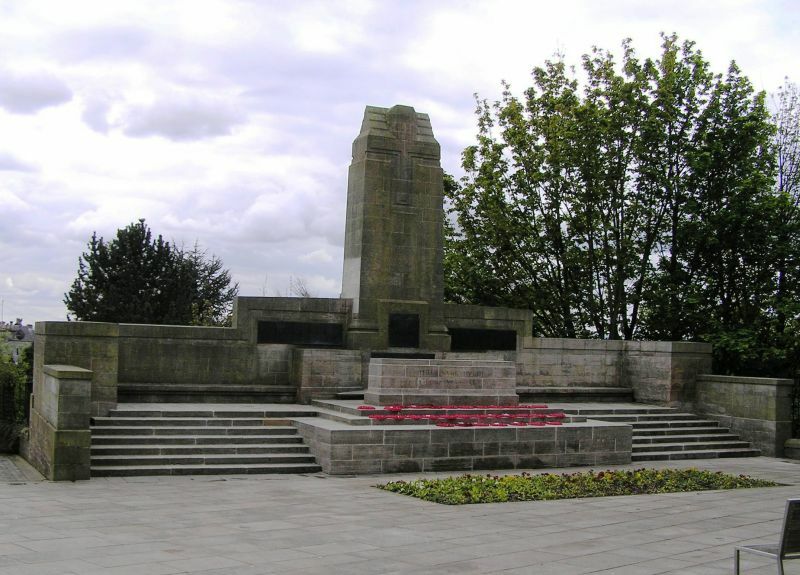 Rectangular-plan World War I cenotaph. Austere symmetrical geometric design constructed in sandstone ashlar. Coped wall orientated NE/SW along existing wall at edge of steeply sloping land and returned at either end. Wall stepped up at centre of main axis to either side of slightly projecting pier, gabled at apex and carved with prominent cross to both inner and outer face. Slightly projecting panel with flanking ledges at base to principal (W) side of pier bears lead plaque with burgh coat of arms, dates of First World War in Roman numerals (MCM XIV - MCM XIX) and a dedication to 'The men and women of the city and Royal Burgh of Dunfermline who died for their country in the great war'. Lead plaques below and set back to flanking walls bear names of those concerned. Altar-like construction on stepped base centred in front inscribed 'THEIR NAME LIVETH EVERMORE'. Flanking steps project forward to either side in betwen return walls, which are stepped down here. Terrace formed at head of steps in between altar-like construction and main axis wall. An austere and imposing cenotaph.